This technical note will describe what happens and how you can work with folder structures (nested sub-folders) uploaded to a case in Lexbe eDiscovery Suite. The steps below will help you create and upload sub-folders properly. -Go to the Case>Add Case Documents page and click on the 'Upload' button. This action will open the dialog box requesting, where you can set the a couple fields before the upload, such as; Batch Title, Doc Source, Case Participant, etc. After clicking 'Next', the dialog upload box will move to the final page. Once the Settings have been set, close the window and click on the 'Add Files' button at the bottom and select the files to add from your local system. Depending on your computer platform, you also have the option of dragging the batches from your computer directly into "Upload Documents" page. Progress is shown for each individual batch and for the entire upload. Do not close the upload window before the upload completes or the upload will be disrupted. When the upload is complete, the 'Cancel' button will change to 'Done', you will see an 'Upload Complete' message and you can close the upload window. You will then see the newly uploaded batch in the "Add Case Documents' Window. You need to wait for processing to be completed until the 'Upload Complete' message displays, and then close the upload window. Still from the Add Case Documents page you can open a specific batch by clicking on its link and this action will take you to the Browse page so you can view all the documents expanded. 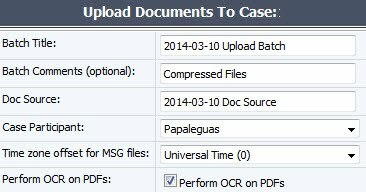 From The Case>Add Case Documents page you can open specific batch of files by clicking on its Title hyperlink. You can also apply filter by 'Upload Batch' from the Browse or Search pages. It will keep a record of all batches by titles and help you identify the set of documents you want to review. 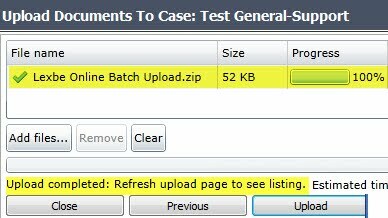 When you upload folder structures (nested sub-folders) in a zip file to Lexbe eDiscovery Suite, by default all the files along with their sub-folders will be automatically assigned to a general folder called 'Unassigned'. The upload will carry over the same sub-folders titles. If you want to open sets of documents assigned to specific folders in the case, click on the 'Select Folder' hyperlink from the Browse or Search pages. This will bring up the Folder Tree box and list all the sub-folders created in the case and the number of files assigned to each one ( e.g. Unassigned (10436)). If you select a specific folder by clicking on the title (e.g. Folder 01), it will open the set of documents assigned to that sub-folder. To access documents assigned to specific folders set up in a selected case, click on "Folder>Select Folder" located on the left corner of the screen. A new window (folder tree view) will be opened and list all folders that have been set up in the selected case. Folders include groupings of court documents, such as pleadings, depositions, orders, as well as specific document types produced in discovery, such as letters, memos, email, etc. Clicking on any folder will show the documents included in that folder in the document window on the right. Clicking on the case name at the top of the tree will show all documents in the case. To manage, create or delete folders please go to the Management>Manage Folders page. c) Filtering on the 'Source FilePath' to find the Original Folder Structure. Source FilePath is a built-in field found in then Browse and Search pages, which refers to the Folder Path within Microsoft Outlook and keeping folders and sub-folders information. It is named after the original sender of all email data, and you can sort or apply filter with 'Source FilePath' field (e.g. Susan Cooper\Native Files.zip\Alvarez Memo to file.doc). Please note that the Source FilePath field retains the original structure for evidence purposes and cannot be moved. Lexbe eDiscovery Suite will not generate separate internal sub-folders exactly the way it is in Outlook or other email software, because email programs might present nesting of structures too complex or deep, such as Outlook email (PST or MSG) and Outlook email (EML). We have seen situations with nested labels where multiple files are not being displayed, access restrictions and it might also affect the file location. Then the final step is to zip that structure and upload to the case. This will create and assign sub-folders in Lexbe eDiscovery Suite. >apply filter by the batch you recently uploaded, select the documents by the Title and then apply 'Multi Doc Edit' to move selected files to a specific sub-folder. If you are reviewing individual files from the Document Viewer, you can reassign the file to another to a different sub-folder by clicking the on the 'Unassigned' hyperlink (e.g. IMAGES), and then change the sub-folder location. It will be updated automatically. a - PST data are like container files, giving you the option to export from Outlook all the messages and internal folder structure (nested labels) together without compressing into one or more ZIP file format. If that is the case, then you can upload the PST to Lexbe eDiscovery Suite directly. b- Emails can also be extracted individually as MSG files, including the email message, attachments, and metadata extracted from Outlook (no internal folder extracted). 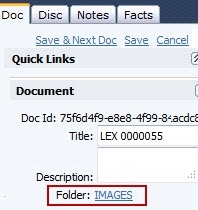 You can also upload the MSG to Lexbe eDiscovery Suite, but in order to map the ‘Source FilePath’ including internal sub-folders (if this is an issue); first you will have to compress the MSG in a ZIP file format with the file folders as part of the ZIP file. During eDiscovery jobs or load file uploads of TIFF files, the sub-folder structure is not preserved. Folders are recommended for small cases only and coding fields (such as in load files) should be used for larger or complicated cases, and any with load files. The original file path may be preserved as metadata in the load file, and if so, will be associated with the Lexbe Original Source FilePath field if present. Any filters applied from the Browse and Search pages are automatically saved under the 'Filter Quick Links' section. Whenever you click on the ‘Apply’ button, this action automatically preserves the filter records on the list view under the ‘Recent’ section and creates filter hyperlinks to open specific set of documents. Last but not least, you can also rename and 'Pin' the filter hyperlinks to separate and keep track of the most used filters. When this is done Pinned filters look a lot like Folders, but without the disadvantages.